E.ii.R. 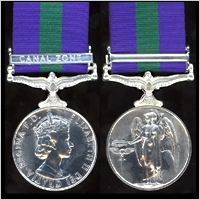 Obverse and with any of the various clasps(bars) that were issued to denote service in various theatres of operations. MALAYA, CANAL ZONE, CYPRUS, NEAR EAST (SUEZ CRISIS 1956), ARABIAN PENINSULA, BRUNEI.